We try hard not to miss our weekly post, but we were just having too much fun over Christmas and New Years to squeeze one in. Here is everything you need to know about all the fun we had in the past couple of weeks, here in Boot Key Harbor and a couple of trips home. We had some very nice weather the week of Christmas and we broke out the kayaks and checked out the harbor. We went home the weekend before Christmas because we just couldn’t bear to miss Rick and Jennifer’s ugly sweater party. We had so much fun eating, playing corn hole, stealing gifts, playing pictionary and hanging out with good friends. Rick and Jennifer’s Christmas party! We got up early the next morning and brought Austin and Kiera, our not-so-little any more grand-children, back to Boot Key Harbor with us. We had a blast feeding tarpon at Robbie’s, a day trip to the Theater of the Sea, catching their first fish, Sombrero beach and watching pirate movies with them. And the win goes to Nanny and Pop Pop for wearing them out! We had a great couple of days home with everyone for Christmas, although I didn’t get enough pictures, here are a few. Christmas Eve lunch with Josiah and Sami. A happy Nyah with her Darth Vader toy. Christmas dinner with the family at our daughter’s house. Great Grandma Joyce and new bikes from Santa. We couldn’t get out of town without a little hard labor, in the rain of course! Quite a sizable pile, if you don’t mind me saying! There was a full moon on the harbor when we returned. When you are living big on a sailboat, your Christmas presents are big too. We gave each other new sails for Christmas this year, thank you honey, they are beautiful! New sails for Christmas, top left is the new jib, others are the new main sail. 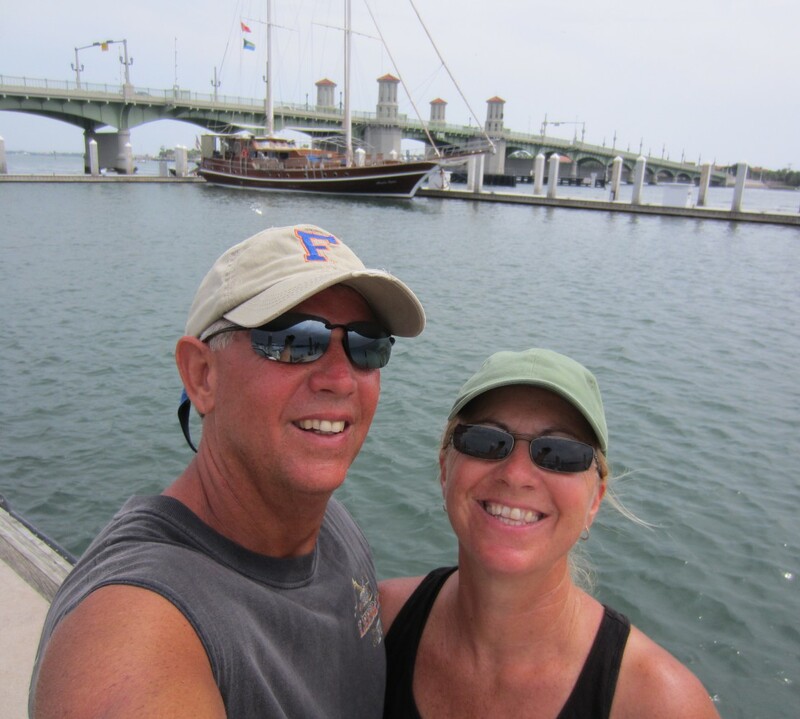 We brought the New Year in with Georgette and Gary in Key West. It was a fun night, except for the bus ride home! Some of us (me) don’t do getting home in the early mornings as well as we used to!!! Bringing in 2016 in Key West with Gary and Georgette. This was our Sunday weather, everyday can’t be perfect in paradise! The Captain has a new supervisor for daily chores, Pepe is on top of keeping the job going right. After the rain on Sunday and Monday our cold front has arrived, low of 68, highs in the mid 70’s. It might be about time for you to come and visit us down here in paradise! We hope you come to see us soon.